Reading Nate Silver’s post was painful. He proved the Seahawks are a woefully bad playoff team (although they’re improved from last year). But should we be surprised that a 7-9 team made the playoffs? Yes, a 7-9 playoff team should only make the playoffs every 32 years. A team making the playoffs with 7 wins is very far from the mean. Its Z score is 2.6, meaning a probability of 0.4%. Pretty rare. But why didn’t people make a stink about the Chargers making the playoffs in 2008? Well, it’s just not that surprising. Eight wins is only 2 standard deviations from the mean, meaning a 3% chance of making the playoffs (or once every 4 years). 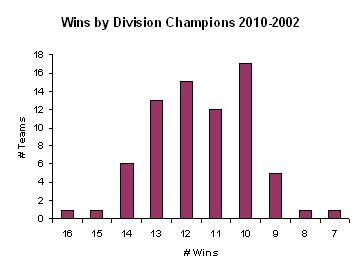 Since it hadn’t happened in the previous 6 years since the divisions had been expanded, it was bound to happen. But 7 wins? That’s just crazy. It should happen only 1 time every 32 years. Too soon!